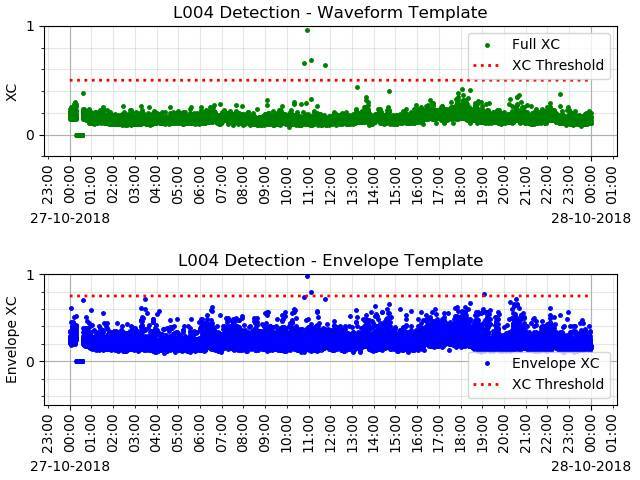 Earthquakes are detected at site L004 using a cross correlation (template matching) technique. These detections are automatic and not reviewed. See the authoratative events list at the BGS (BGS). Each point on the plots represents the result of comparing a template (the ML1.1 on 29/10/2018) with the continuous data (see the live data. Points falling above a threshold are potential earthquake detections. See an example for 27/10/2018 , where 5 events were detected by the BGS. 4 of these events fall above the detection threshold and one is just below. Two approaches are shown: (1) matching the complete waveform (2) matching an envelope around the waveform.